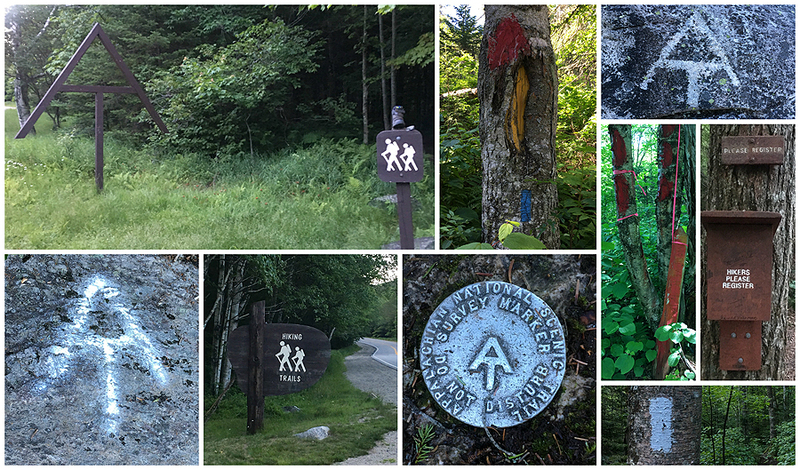 - Whitney and I celebrated Independence Day with a bang by hiking the Grafton Notch Loop. We left our house in Gorham at 4AM, taking two cars, we left her car at the southern trailhead on ME 26 for a resupply, as this is where the Grafton Loop Trail crosses the road about 21 miles into our 38 mile hike. From here we drove my Jeep to the northern trailhead at the top of Grafton Notch and started hiking at 5AM. 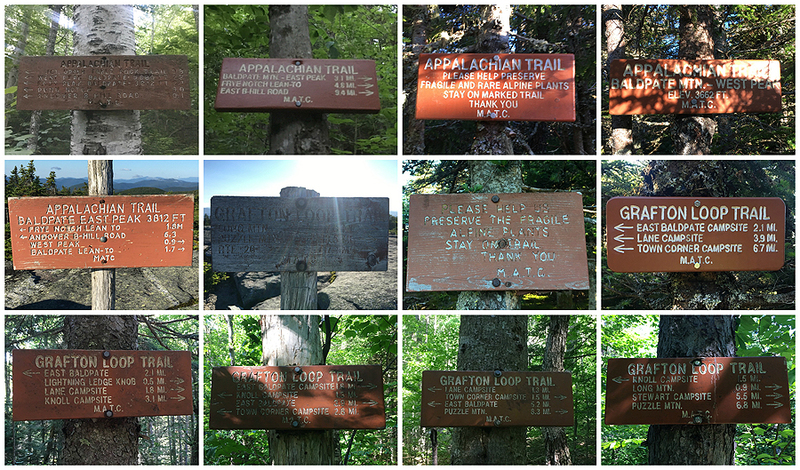 - We decided on hiking clockwise, starting with the steep hike up to the Baldpates, we started on the Appalachian Trail for the first four miles. The hike up to the Balpates, while steep at times does have something I never really have seen before, rock staircase switchbacks, a marvel in trail work and very impressive. - The first summit of the day was West Baldpate, which has restricted views near the summit but soon opens up as the trail descends into the Balpate Col. Hiking through the col and then up the steep rock slabs of East Balpate is very cool. The bottom of the col goes through a fragile alpine meadow with great views and there were flowers everywhere, all past their peak, but still beautiful as the morning sun shined down upon them. The hike up to East Baldpate is on the steeper slide but the rock slab is extra grippy so there were no issues on the ascent. As we hiked up we took time to look back across the col at West Baldpate and Old Speck rising above it. The summit of East Balpate has 360 degree views, which are phenomenal. Believe it or not this was my first time on this peak and I have been looking forward to hiking it for quite some time, and I was not disappointed! 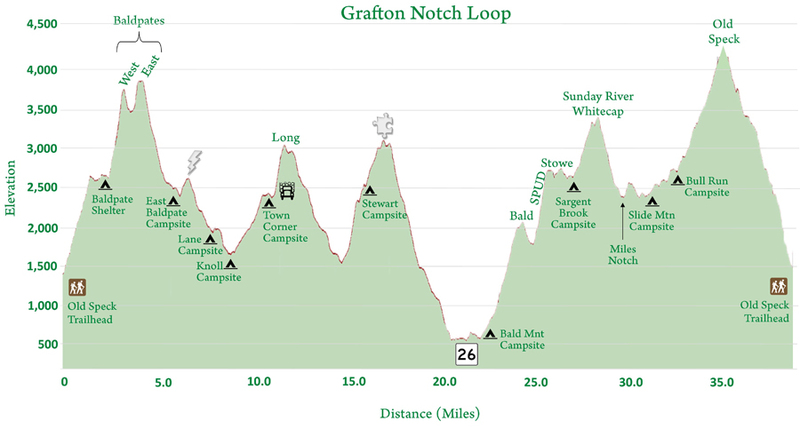 - From the summit, we left the Appalachian Trail and hooked onto the Grafton Loop Trail descending rapidly over rugged rooty terrain for a few tenths of a mile before the grades eased up and the footing became soft. We were in for quite the treat as the footing would be incredibly forgiving for practically the rest of the day. - We passed by the East Balpate Campsite and soon made our first of many crossings of Wright Brook, before heading over Lightening Ledge and passing by a fine outlook with a great view across the notch and down into Bear River Valley. - Below Lightening Ledge we descended towards Lane Campsite, the trail become very grown in, still easy to follow, but the hobblebrush had encroached the trail, to the point where it was at times over Whitney's head! Luckily these stretches were a few hundred feet at a time and the hobblebrush was dry so it was a non issue. - The trail parallels and crosses Wright Brook several times throughout the section by Lane and Town Corner campsites. It's a pretty hike through the forest with dwarf spruce blanketing the floor of the woods in spots as the trail meanders on through. - Just past Town Corner Campsite we crossed into private lands and made the steep ascent up to Long Peak. This was the only sub-par part of the hike as the trail went through a recently logged area, it was pretty buggy and not scenic, plus the trail was very steep for a half mile before going back to moderate grades with welcoming switchbacks. - Long Peak is a wooded summit but there is a really nice spur path to an outlook just to the south of the summit with a great view of Sunday River. After the outlook the trail makes the long descent down to Chase Hill Brook, traveling over an old road for a quarter of a mile just before crossing the brook. The trail leveled out for a stretch as it headed through open woods, there was a clear cut on our left, and the trail skirted it a little bit at times and one time we actually got lost for a few hundred feet along this before realizing we needed to be back in the woods, Whitney spotted a blaze to our right so we whacked over to it and noticed our detour mistake. 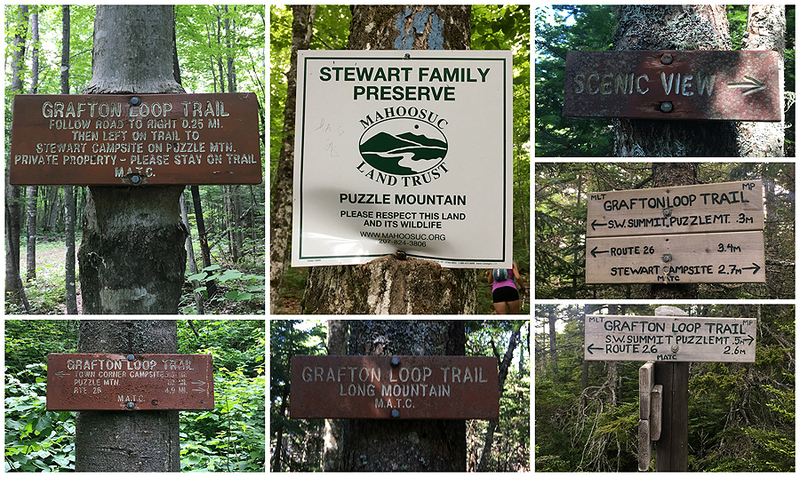 - Eventually the trail starts to climb up Puzzle Mountain, passing by Stewart Campsite before making the final push to the summit of Puzzle Mountain. Finally, after more than sixteen miles of hiking we saw other hikers just below a great outlook on a southern knob of Puzzle Mountain. The drop down back to ME 26 went by fairly quickly and we made it to the trailhead just before 1PM, and just under eight hours covering 21ish miles. - At the car we took a twenty minute break to relax, eat lunch, and prepare our gear for the second half of the hike. 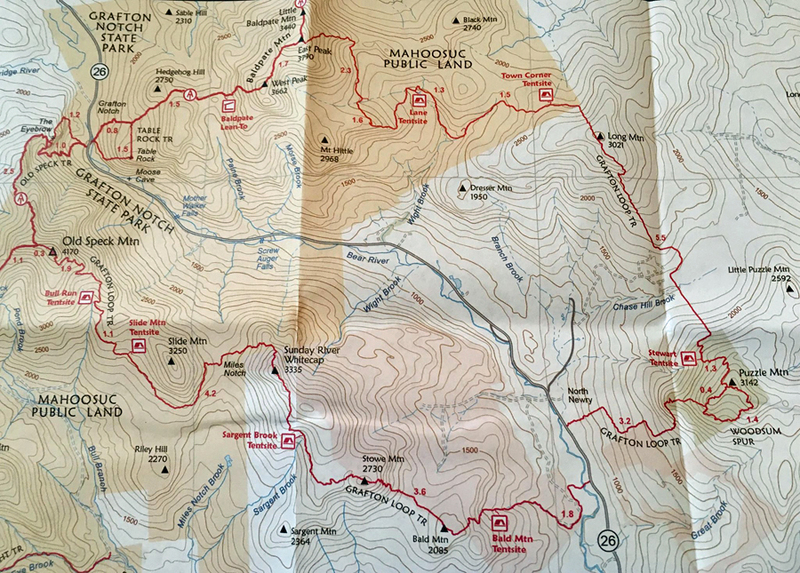 - We started off by hiking just over half a mile south on ME 26 before hooking a right onto a snowmobile trail which doubled as the Grafton Loop Trail for about a mile before entering the woods for good and up to Bald Mountain campsite and the summit of Bald Mountain. - Past Bald Mountain the trail headed through more beautiful woods before making a steep climb up to Stowe Mountain, the last steep climb of the day believe it or not! Stowe had some nice semi open ledge hiking through a bushy area with some nice views. 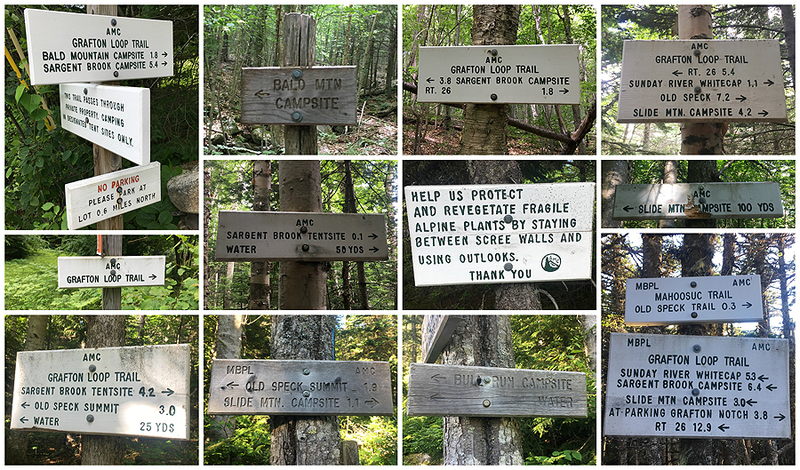 - The trail leveled off with a minor up and downs for awhile before reaching the Sargent Brook Campsite before ascending to the next summit of the day, Sunday River Whitecap. - What can I say about the summit of Sunday River Whitecap...we were both blown away by its beauty and the views. There are very well constructed scree paths, one to a viewing outlook area, and raised wooden planks protecting the fragile vegetation. We took a fifteen minute break up here and took in views that rival almost any mountain in the area, I know I talk about views a lot, but this one was special, it must be even more amazing in the fall! - After leaving the summit, we were treated to even more views descending the northern open ledges of Sunday River Whitecap, killer views of Old Speck, the notch, and the Baldpates for about a half mile before descending steeply to Miles Notch. - Over the next three miles the trail skirted around Slide Mountain in the woods over gradual grades through dwarf spruce to Slide Mountain and Bull Run campsites. - Now it was the time for the final climb up to Old Speck, we were expecting the trail to get pretty steep and rugged, but we were extremely surprised that it stayed mostly gradual to moderate with damn good footing and switchbacks all the way to the summit tower! - We climbed the tower and took a bunch of pictures spending about ten minutes up there before heading back down and making our way out. The oh so forgiving footing was no more, the swithcbacks were no more, and the easy to moderate grades were gone too. Luckily, we've both been up to the summit of Old Speck a few times so we knew it was back to knee hammering, eroded, rocky, rooty trails for the last four miles. - Even with the gnarly footing, we made great time back to the trailhead, hiking through the golden hour and finishing at 8:15PM, fifteen hours and fifteen minutes after we started, not seeing anyone for the entire western half of the hike! - We jumped in the Jeep, headed south on ME 26, retrieved Whitney's car, headed home, grilled up some burgers, downed a few cold ones, and talked about how awesome the Grafton Loop Trail was. - It really is a great area, and with numerous designated campsites it's perfect for backpacking, or a long day hike for those looking to push themselves, and would be a great trail to run too! We start the hike on a trail Whitney is very familiar with, the Appalachian Trail! Hobblebush, it encroached the trail, and as you can see was five feet high in places! Old woods road and hiking by a logged area, only ugly part of the day! The hike along Miles Notch is just like the rest of the trail, beautiful! Another great post. Thanks Chris! I sooooooo want to do this one. Maybe 2018 summer to get max daylight just to enjoy those VIEWS!!!! Hope you enjoy my blog, thanks for reading! All content, pictures, and text are property of Chris Dailey unless otherwise noted. Content cannot be used, copied or distributed without my consent. You are more than welcome to link back to my blog, use in articles, email, social media, etc. with my permission. If you have any questions please contact me at cdailey@hpearce.com. - Copyright © 2009-2019. All Rights Reserved!